Summer 2018 might be coming to a close, but with so much going on at New Eagle, you’d hardly notice things cooling down! As we motor into fall, check out what’s happened in our 2018 third-quarter recap. We’re pleased to announce that we’ve added new product offerings to our shelves that make it even easier for you to take control of your machine’s electrification process. The GCM80 is the newest controller in the Raptor family of vehicle controllers. Featuring dual microprocessors and 4 CAN channels, it offers many discrete inputs and outputs to safely perform your EV or HEV design. You can easily program the GCM80 using the unique Embedded Model-Based Development (eMBD) technique with Raptor software tools. The GCM80 can be purchased as a component, or in a New Eagle system built on the Raptor control platform. Single-unit DC-DC converters are available, as are combined unis to make integration even easier. Learn more by contacting our team. 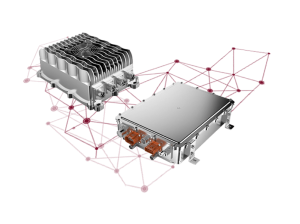 Our new EV High Voltage products, like the 1.5 KW DC-DC converter and the Combined Charger/DC-DC Converter and PDU for 400V systems, are now available as components or in a New Eagle system built on the Raptor control platform. Single unit Chargers, DC-DC converters are available, as are combined units to make your integration effort easier. Learn more by contacting our team. Crain’s Detroit Business has awarded New Eagle with a 2018 Cool Place to Work award in recognition of our company culture, employee benefits and overall team satisfaction. On its list of 100 winning companies, New Eagle earned Ann Arbor’s number one spot and metro-Detroit’s fifth spot. Check out the coverage on Crain’s Detroit and Ann Arbor SPARK! We’re chalking the W up to an awesome team, a great set of partners and suppliers, and, of course, a set of corporate values that keep our eagle eyes focused not just on working well, but on doing good in the world. Interested in joining our team? Learn more about career opportunities here. New Eagle exhibited at the 2018 Electric & Hybrid Vehicle Technology Expo in Novi, Michigan. New Eagle exhibited at Novi, Michigan’s Electric & Hybrid Vehicle Technology Expo (EVT) on Sept 11-13 in booth 316. We had a great time showcasing our latest EV/HEV innovations and connecting with our partners and suppliers! The annual EVT Expo features the latest and greatest EV/HEV technology all under one roof. 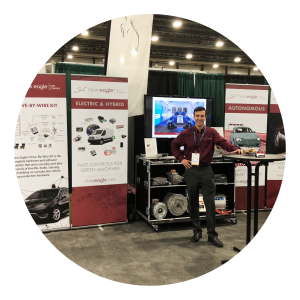 It’s a can’t-miss show, but if you couldn’t make it this year, no worries – just check out our refreshed EV page to learn how New Eagle can help you take control of your next EV/HEV development cycle! From all of us at New Eagle, we wish you a wonderful autumn. As always, don’t hesitate to contact our team of experts if you have any questions. We’re committed to your success as together, we develop a better world through technology.